This is one of my most used poses. I almost always begin every private session I teach have with this pose. It allows for the opening of the back of the thigh/hamstring muscles while keeping the lower back in a safe position on the floor. I know, I know - why go from Supta 1 to Supta 3, and not chronologically to 2? In this variation of Supta 3, it’s actually a closer segue! This pose moves the opening to the outer hamstring, IT band and glute muscles. 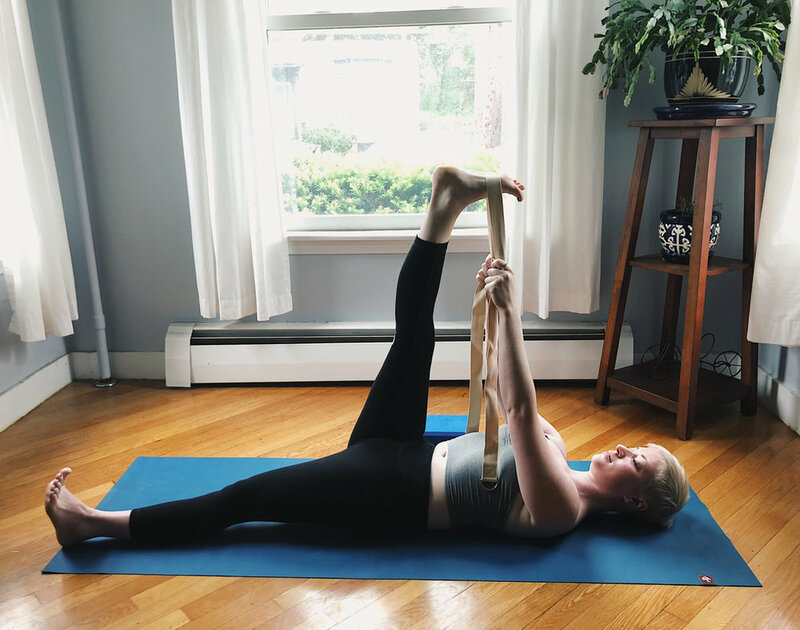 This shape moves the opening into the inner thigh/adductors and is potentially the most gravitationally difficult pose of the bunch, as such it's pictured with and without block support for aerial leg. 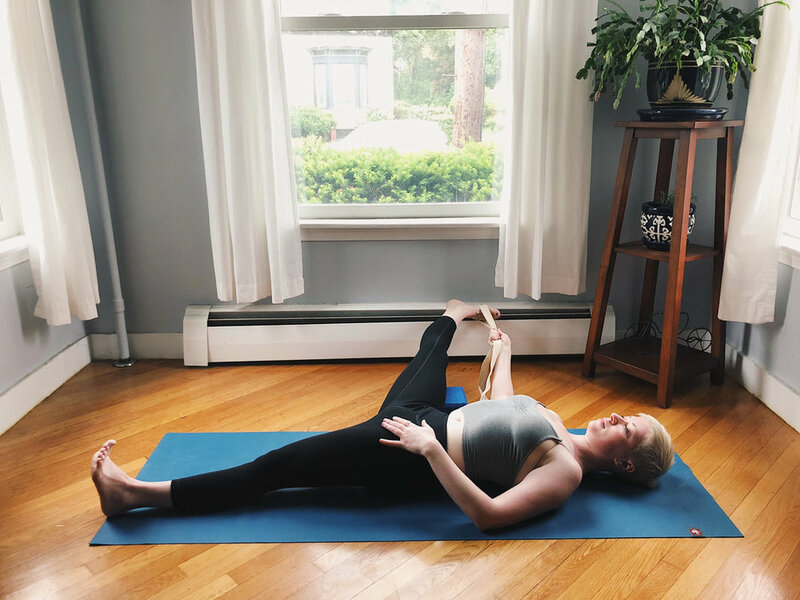 This shape brings the opening back towards the outer hips, but usually a bit deeper into the back of the glutes/external rotators than Suptapadangustasana 3. This version is particularly useful for those with knee issues or low back injury/dysfunction. From Suptapadangustasana 2, Draw right leg into midline and bend the left knee, stepping the left foot to the floor. Cross right ankle (just above the foot) over the left thigh. Right hand and arm thread in between the two thighs, left-hand wraps around the left thigh and hands clasp behind left thigh or left shin. Use the clasped hands to pull the left leg closer to the left shoulder and resist the right knee away from the right shoulder. Stay 1-2 minutes. Arms getting tired? Set up about shin distance away from a wall, cross right ankle over left thigh then step left foot onto the wall for support AND/OR have a block or two under the left foot for similar support with less intensity. My students have heard me say this a thousand times: This is the MVP “most valuable pose” these days in my book. 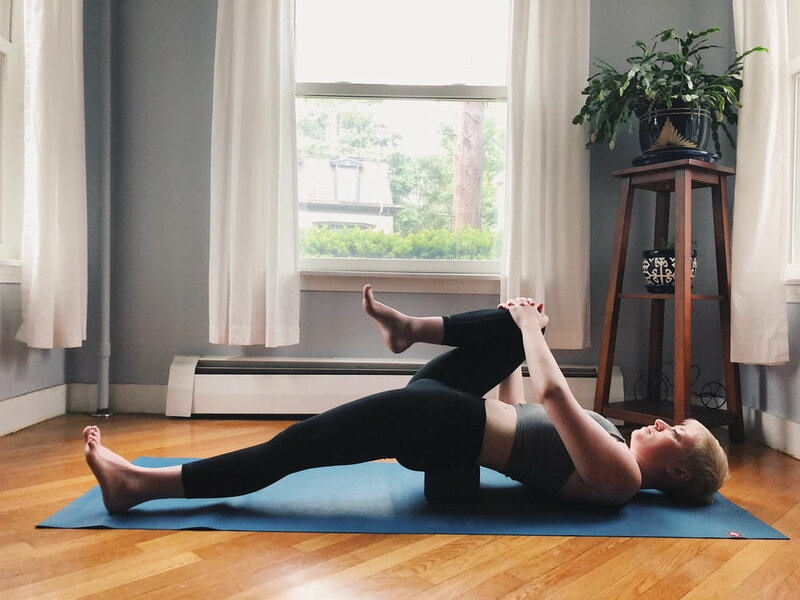 With the amount of sitting inherent in daily life, plus all of the propulsion we do (walking, running, cycling) the fronts of the hips are usually severely tight and there are very few passive positions that allow for lengthening these tight areas. Supported bridge is just the ticket! This is probably the pose that I use and give as homework the most right now. With a block nearby, set up laying on the floor, both knees bent. Feet and knees about as wide as the hips. 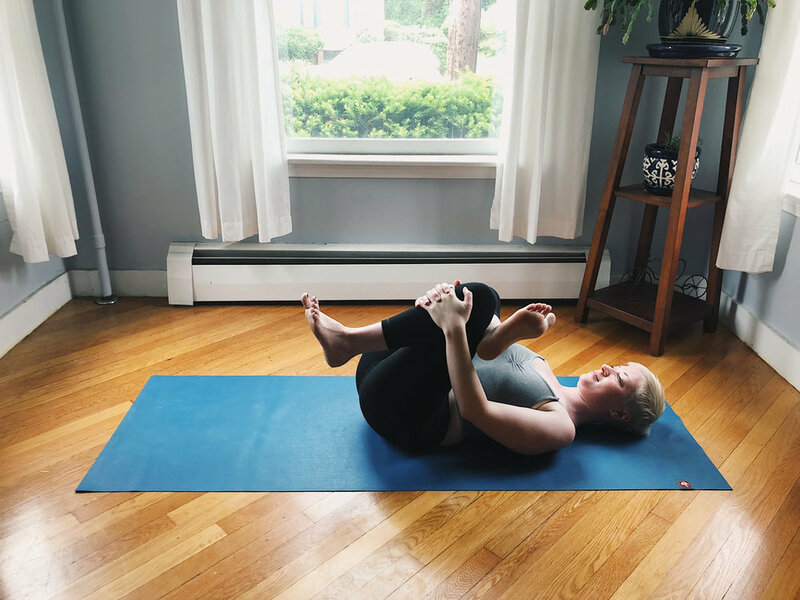 Push into the feet to lift the hips and slide the block under the sacrum (a flat-ish triangular shaped set of fused vertebrae at the base of the spine, just above the tailbone.) Both knees can stay bent, or one leg can straighten and drop down towards the floor. To deepen perhaps the other leg bends and pulls back towards the torso. It is possible to straighten both legs in this pose, but be very mindful of the low back as it can get compressed in this position. Stay 1–2 minutes each side.